When Google first published its free publication explaining the steps it takes to decide what ranks where in search results (How Search Works), it said the Web was made up of “over 30 trillion individual pages”. That was in 2013. Here's how it looked in November 2017 when Google’s Gary Illes said that they were aware of roughly 130 trillion pages. That’s over 300 percent growth in just 4 years. When the web grows, competition grows also - there are only 10 spots on the first page of organic search results, and that number has stayed constant since Google first rolled out in 1998. When you have more and more content competing for those same 10 spots, it gets harder to achieve meaningful results. It also means the longer you delay search engine optimization (SEO), the further you fall behind. In order to boost your SEO performance, do these six things right away to get your process on track. A 2015 survey by Capital One Spark Business found only 17% of small businesses actively invest in SEO. That means the vast majority - some 83% - don't. Start optimizing now. The first step is always the hardest, but if you don't start, you'll continue to fall further and further behind. SEO is complex, far-reaching, and ever-changing. While there are lots of do-it-yourself SEO tips and tutorials readily available on the web, I don’t recommend you go down that path. Small businesses lack the capital, purchasing power, economies of scale, raw talent, and brand recognition of large businesses. The demands for your time are already too great. Because SEO is an investment, it should be approached much the same way you would with the purchase of any other large ticket item, like a house, a car, your education, or business. Do your homework, figure out the right investment for your particular situation, and then set about earning it. 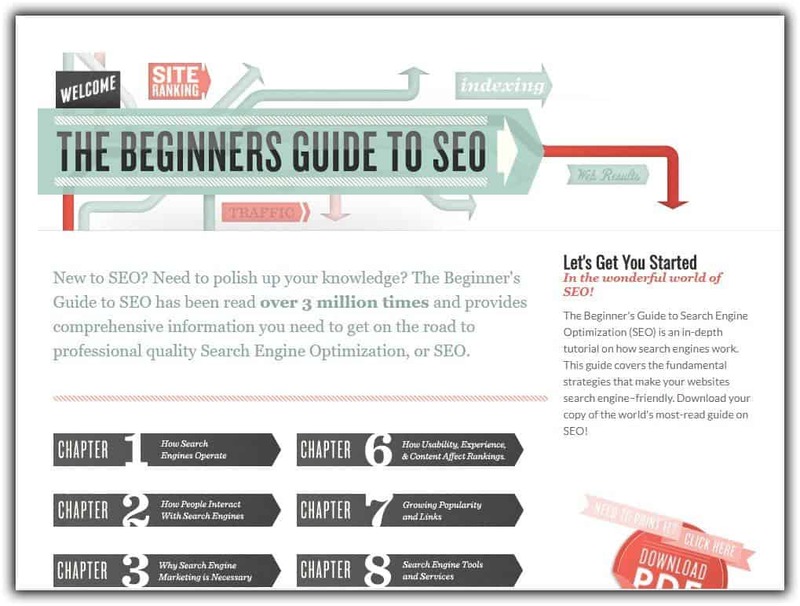 Educate yourself on the basics of SEO - the Moz Beginners Guide to SEO is all you'll need. You don’t have to become a technical expert or learn how to differentiate between a '301 redirect' and 'canonical tag', but you do need to get your head around how search engines rank websites and how usability, content, and links influence results. You should, at the very least, be able to recognize bad advice when it is given to you. Every business is different, and the best approach and strategy for optimizing your website will be unique to your business. There are lots of SEO companies, and not every one employs Google-endorsed and industry-sanctioned best practices. To better your chances of making the right hiring choice and achieving SEO success, Maile Ohye at Google released this helpful video last year. Maile's advice is aimed at preventing you from paying a lot of money without positive results or, even worse, losing rankings. Essentially, that means poor quality websites are not going to rank well on Google. Google rewards websites which offer high-quality content to their visitors - it says so itself on the Official Google Webmaster Central Blog. So how does Google define quality? Lucky for us, Google has shared what it considers to be high-quality content in its free Webmaster Guidelines. While they are extremely detailed and helpful, they're also lengthy to consume - another reason to seek out the advice of a useful SEO. The key takeaway here is that “fluff” (common-place, non-specific, inaccurate, duplicate, and unhelpful) content offers a poor return on investment and doesn't provide lasting or compounding value over time, because it isn't memorable, shareable, or worthy of an online mention. Those things earn repeat visits, links, and exposure - all key ingredients to online success. Seek out and understand your customer pain points, publish content that demonstrates empathy, understanding, and expertise, and eventually you'll earn people's trust, and a reputation for quality. You'll become a go-to resource for your website visitors - and they, in turn, will willingly advocate on your behalf. Lastly, don’t expect instantaneous results - expect to see improvement at a rate proportional to the investment you’re willing to put in. The “right” amount of investment will be different for every business. SEO is a process, just like any other form of marketing or reputation building. It's about hundreds of big and little things which add up over time. You have to commit to the long-run, get found, and provide value. If you do that, you'll eventually outrank the competition, and convert website visitors into loyal, paying customers.